The line is situated in the Curraghs Wild Life Park, Ballaugh, Isle of Man, which can be reached by car or from Douglas, Peel and Ramsey by Isle of Man Transport bus routes 5 and 6 group. The Manx Steam & Model Engineering Club was formed in 1985. Three or four of the members had already made 5" or 3 1/2" gauge steam locomtives and, after three of four seasons experimenting with a portable dual-gauge track, it was decided to look for a site where a permanent club track could be built. 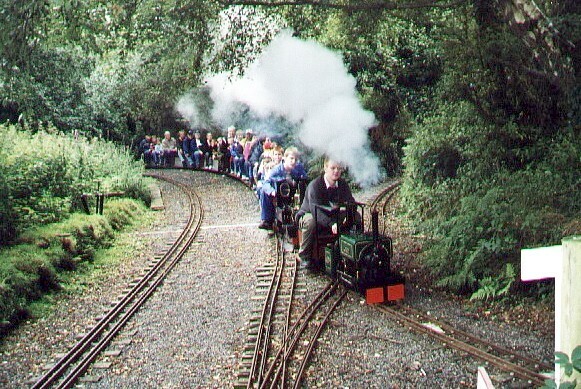 Negotiations with the Isle of Man Government resulted in a concession to build and run a three-gauge circular layout in the Island's Wildlife Park. The gauges are 3 1/2", 5" and 7 1/4". Work was started in the late sumer of 1991 and the railway, called the Orchid Line (after the wild orchids growing in the area), was opened by the Island's Chief Minister in May 1992. At first the track consisted of a single circuit with a passing loop and a station. There was also a steaming-up area with a turntable. the Club agreed with the Park authorities to endeavour to run the railway for the public every fortnight. After two years' successful running, the Club obtained permission to extend the track from its initial 550ft to a length of 1750ft. This was carried out in two stages; in 1996 an additional circuit was laid down outside the first, then in the following year the second stage was completed by driving a third circuit, to make a figure of eight. By this time the locomotive stock had been increased by the addition of four 7 1/4" gaugue engines. The 3 1/2"! gauge was confined to the original circle. In 1999 the Club was given permission to extend the track to some 3,042 feet by pushing a winding extension throughthe wooded bog area called the Curragh. The work was made possible by a generous grant from the Mann 2000 committee and a significant private donation. The Millennium extension was opened in August 2000. The railway is controlled by signals throughout its length with sector control. In its course it crosses five steel bridges, five level crossings (controlled by flashing lights and buzzers), two diamond crossings and nine sets of points. Before running each year the track is inspected and passed by an official Government-appointed railway inspector. Nearly all the trains are fitted with vacuum brake and carry a guard. Public services are operated every Sunday and Bank Holiday throughout the season. Since 1992 passenger support has steadily increased to pass an annual total of more than 15, 000 for the 2003 season. The 100,000th passenger since the line opened was carried in August 2004. The locomotive stock has increased to include five 5" and seven 7 1/4" gauge steam locomtives and a 7 1/4" gauge petrol hydraulic locomotive.